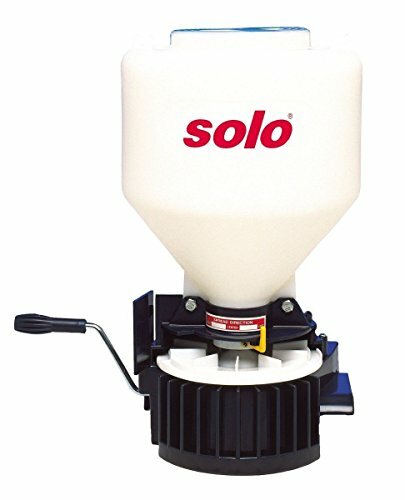 Solo 421 Portable Spreader is an alternative to a wheeled spreader allowing you to spread granules in areas where wheels will not go. Equipped with a comfortable padded strap that goes across the shoulder, an adjustable 240 degree spread radius (to keep granules from coming back on the operator), and controls for volume and direction at your fingertips the Solo 421 Portable Spreader is made with the operator in mind. Constructed of rustproof poly the spreader is easy to clean and durable. With a gear box that is completely enclosed and has lubricated metal gears the Solo 421 Portable Spreader is made for a long useful life. The agitator in the spreader helps granules to fall evenly onto the impeller to insure a uniform spread and to prevent blockages. Whether full or empty the hopper always stands upright. Dimensions: 19 in. H x 11 in. W (without handle) Material / Construction: Polyethylene Special Features: Fully enclosed gear box with lubricated metal gears assure long life and durability. Padded strap with comfortable, cross-shoulder design. 6 in. opening with screw-on cap. Hopper stands upright whether empty or full.